This time, Spike nails it. Finally, Spike the corpse flower is in full, crazy beautiful bloom at the Chicago Botanic Garden. Almost three years ago, the unpredictable plant showed promising signs of blooming but ultimately didn’t have enough energy to open up. 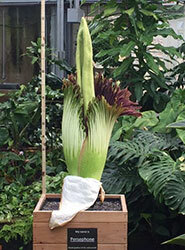 Now, in bloom, Spike is nearly 7 feet tall—our biggest corpse flower ever—and smells like rotting meat or flesh. Drop by the Semitropical Greenhouse during regular visitor hours to take a deep breath and celebrate one of the plant kingdom’s most glorious events. The corpse flower usually stays in bloom for 24 to 36 hours. Save time and buy parking in advance. Spike is back—and rockin’ the bloom. The corpse flower, or titan arum (Amorphophallus titanum), is native to the rainforests of Indonesia. In bloom, it is known for its size, stench, and beauty—look for the deep crimson color of the frilly spathe, or modified leaf, around the tall central spike. 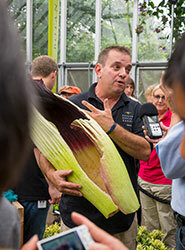 Spike was our first corpse flower to begin its bloom cycle in August 2015. More than 75,000 people came to the Garden to see Spike, and more than 300,000 people around the world watched the plant’s progress on live webcam. But the notoriously fickle plant got stuck in pre-bloom mode. Where has Spike been since then? We moved the plant to our production greenhouse and repotted Spike’s corm, which is a beach ball-sized underground tuber. Ever since then, Spike has been collecting energy from the sun to begin the bloom cycle again. When Spike flowers, we will collect pollen for future use, but we do not plan to pollinate Spike. 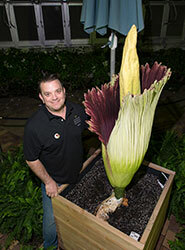 Spike has the same parents as Alice, another titan arum that bloomed in 2015. (We successfully pollinated Alice and obtained numerous seeds.) It would be better to pollinate one of our plants that come from different parents in order to promote genetic diversity. What’s different about Spike this time? Spike started this second bloom cycle only two and a half years after the first one. Usually, it takes three to five years for a plant to “recharge” and flower again, so Spike was on a faster pace. 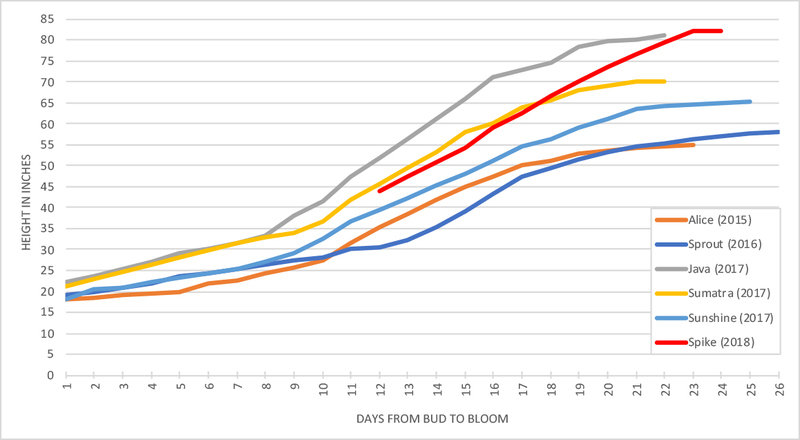 We’ll study the data, compare the numbers to Spike’s first bloom cycle, and see what that all means. 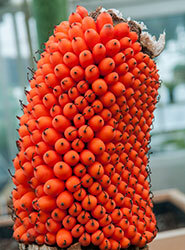 Didn’t you just have a titan arum bloom? Yes; on a memorable day in August 2017, Sunshine opened up on the same day as the partial solar eclipse. The Garden began collecting titan arums in 2003, as part of a worldwide conservation effort to preserve the species. Many of our titans were acquired at the same time, which is why the Garden has had several ready to bloom in a short time period. Sunshine bloomed on August 20, 2017. This was our first titan arum to bloom outside the greenhouse environment. Visit often, bring the kids, spread the word! The corpse flower is a wonderful way to learn and teach about plant science. Selfies with #CBGSpike are encouraged (sorry, no tripods).